“Ewww, I hate mayo!”, I’m sure lots of you are saying. Well, I usually don’t like it myself, and if a recipe calls for primarily mayonnaise, I usually cut it with half sour cream. Even if you love mayonnaise so much that you’d eat it from the jar with a spoon (pardon my look of disgust), I think you’ll love this potato salad. Don’t get me wrong, I adore potato salad, even if it includes mayonnaise. I just try to limit my intake of it cause I think mayo is usually so gross. When I hit on the idea of making a potato salad with the lovely red wine vinaigrette from my panzanella salad as the base, I knew I was on to something. And when I took a bite of this gloriously mayo-free potato salad, full of crisp bacon and savory chives, I was hooked. Forever and ever. I may never eat another mayo-based potato salad again. Be sure your little potatoes are well rinsed, cause we’re leaving the skins on! Cut the potatoes in half short-ways and throw them in a medium pot. Cover the potatoes with water to just about an inch over their tops, and stir in your 1 tsp each of salt and vinegar. Set the pot on the stove on medium-high heat and let them cook for about 25 minutes. It’ll boil and they’ll eventually become tender and awesome. You may be wondering about the salt and vinegar… the salt just acts as a means to further season the potatoes, and the acidic nature of the vinegar actually holds the potato’s starches together and prevents them from overcooking. You know how sometimes you’ll boil potatoes for potato salad and they just fall apart and become like mashed potatoes once you mix it all together? That doesn’t happen here, thanks to the vinegar boil! While the potatoes are boiling, throw together your vinaigrette. In a medium bowl, whisk together your red wine vinegar, lemon juice, honey, salt, pepper, shallots, garlic and dijon until well mixed. While still whisking, stream in your olive oil. Boom! You now have vinaigrette. Set it aside until the potatoes are done. When your potatoes are nice and cooked, drain them and immediately return them back to the still-hot pot. Toss the potatoes around in the pot to evaporate any lingering water, then throw the potatoes into a medium-large bowl. Pour the vinaigrette on top, stir the potatoes around to coat, and put the bowl in the fridge. You want the potatoes nice and cold before you add the chives, or else the heat will wilt them and turn them brown. Ewww. 1 1/2 to 2 hours should be enough time to chill the potatoes, so long as you peek in the fridge and stir them around periodically. If you don’t stir them, I’d guess it could take between 2-4 hours to get them really cold. If you’d rather make this ahead of time, toss the cooked potatoes with the vinaigrette and refrigerate the bowl, uncovered, overnight. Cook the bacon however you see fit, so long as you get it nice and crispy. My preferred method is to lay the bacon in an 8-inch square baking dish lined with paper towels, covering the strips with one more paper towel to cover the surface, and cook in the microwave until it’s crispy. I have a 1300 watt microwave so the times may differ for you, but I generally cook the covered bacon for 3 minutes on high, turn them over and cook for another 3 minutes. I think. I spaced and didn’t write down the times but I usually have a good memory, so you can give those times a whirl and see if the bacon gets crispy enough for you! Keep in mind, it’ll crisp up more when it’s fully cool. Once the bacon is cooked and cooled, crumble it up and set it aside. Chop up your chives and put them in the fridge, along with the crumbled bacon, if your potatoes aren’t fully cool. If they are cool, throw the bacon and the chives into the potatoes and stir well. Taste it and add more salt and pepper if you think it needs it. This is it, y’all. My new favorite potato salad. The flavors just come through so much better when the ingredients aren’t suffocated under a blanket of evil, evil mayonnaise. 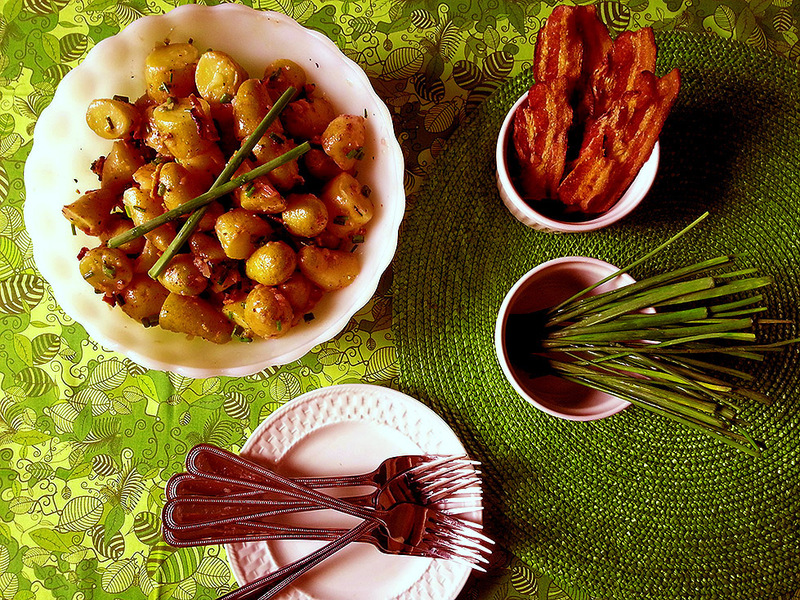 The vinaigrette is punchy and light, the potatoes perfectly cooked and soft, the chives are a wonderful complement to the dressing, and the bacon… is just delicious, crispy bacon. With potatoes. Yum! The first time I made this potato salad, I wanted to tweak the ingredients a bit before I nailed down the final version, so I got to eat potato salad to my heart’s content. I even ate some for breakfast, and it was everything I hoped it would be. My guess is that it’s everything you’ll hope for, as well! Next Next post: golden grahams s’mores bars!